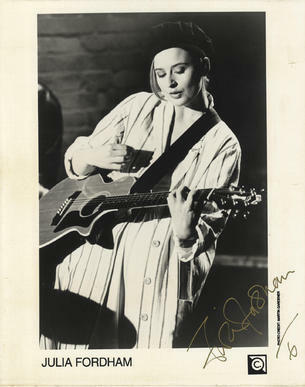 This is an In Person Signed Black and White 10" x 8" Publicity Photo of the British Singer/Songwriter now residing in the U.S.A.
Julia Fordham (born 10 August 1962) is a British singer-songwriter. Her professional career started in the early 1980s, under the name "Jules Fordham", as a backing singer for Mari Wilson and Kim Wilde, before signing a recording contract of her own later that decade. Fordham is now based in California.